HACKNEY probably has more parkland than any other London borough and today the council opens another, which it claims is England’s first parklet. Above is an impression of the small urban space that will provide seating, cycle parking and a splash of floral colour by a car-free, one-way cyclepath on the route of the London Mayor’s planned Cycle Superhighway 1. Money for the project, debuted in San Francisco, has come from the Mayor’s Air Quality Fund (somehow Boris Johnson seems to fit with air — hot air), via enviro-charity Sustrans and with help from bicycle infrastructuralists Cyclehoop. The idea is to reclaim leisure space. 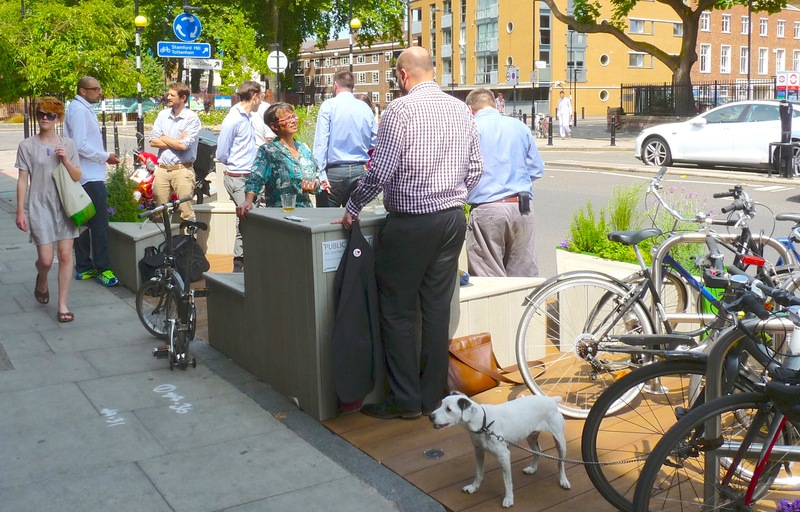 If the micropark/parklet is a hit, the council will open more around the borough, every one of them, says Hackney elegantly, “bespoke to its surroundings”. Sustainability councillor Feryal Demirci wants residents to tell the council about where they would like more parklets. Hackney likes to say it has the highest cycling rate in London and the lowest percentage of car ownership. Police, however, have shown little interest in enforcing the 20mph limit on council-controlled roads.